In what is shaping up to be a spectacular return to the Silver State Classic Challenge, Team Pantera Racing has an unconfirmed field of six drivers -and- "Cafe' Finito" for the finish line. Not wishing to disappoint their adoring fans, the 25th running of SSCC will feature the likes of TPR not seen in 10 years. Veterans and fans alike do not want to miss this year's running. Team Pantera Racing is the first, and still the only vintage race team to field 10 examples of production cars from the era. TPR President Dennis (Mad Dawg) Antenucci is working hard to repeat that success this year. So much so in fact he has offered a $10,000 award to -any- other race team that can field 10 cars from the period prior to 1974. No team has done it since Team Pantera Racing, and Mad Dawg feels confident no team ever will. During that record breaking attendance of Panteras, TPR also sponsored "Cafe' Finito," an Italian diner on wheels. The 2012 running of the SSCC will see the return of Cafe' Finito with a newer and larger rig. All TPR members will have access to complimentary beverages and food at the finish line. All others must pay for entry, and then submit to Mad Dawg's will before being allowed entry. We're being told this season may also see the return of the Brazilian Girls who have been absent on occasion at these events. This is the year you don't want to miss. If you are a Veteran of TPR or a groupie, you had better make plans now to attend this 25th running of the Silver State Classic Challenge. Go all the way, or go home. Jim & Shari Saxton's West Coast Racing Event (previously known as the Ferrari/Pantera Clubs joint event) was a blast yesterday. Okay, Willow, if you haven't been there before has a great 2.5 mile 9-turn course with elevation changes and two long front and rear straights...a great track for a Pantera. Yea, for that little money Jim & Sheri'strack event is a allota bang for the buck. Sanctioned Open Road Racing (ORR) and Track Events. Do you have a Need for Speed? Do you want to see how fast your Pantera will go, legally? Want to know what the big dogs are running in their Pantera? Need advice, need direction, need more than just car shows? The 2011 TPR Awards Banquet took place last October. (yea, the editor is a little bit behind). For the first time in a few years we had more nominations than we had awards. Those who received awards for 2011 certainly deserved them. For enduring years of berating from TPR President and sometimes member at larger Dennis "Mad Dawg" Antenucci, overcoming last minute mechanical problems, successfully arriving, running the Silver State Classic Challenge and making it back home with his Pantera in one piece, the 2011 Ellis Woumnm Iron Man Award was proudly presented to John "JB" Bentley. 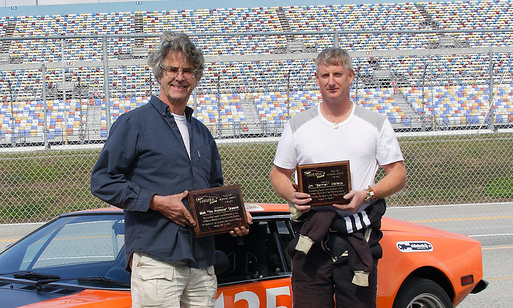 For coming together over great distances and co-driving a Pantera in both the One-mile Shootout and the open road race portion of the Sandhills Open Road Challenge, each one driving one pass of the shootout and one leg of the open road race, the 2011 Gary Hall Memorial Award was proudly presented to two recipients this year, Mark "The Professor" Skwarek and Jim "Batman" Wallace. You can see video of their exploits on the TPR web site in the Video Gallery. For unwavering personal support of Team Pantera Racing both in spirit and in person, David "The Pope" Adin received the 2011 SOBill Award. Please join us in congratulating these fine individuals who are upholding the spirit embodied in those words from Tony Harvey many of us will never forget: Use your car for what it was meant... DRIVE IT!